Polar Bear Solutions release the flush wall station for the Philips TSU9800 touch screen remote. In conjunction with Philips and Custom installers, the product has been developed to address an opportunity in the Philips TSU9800 offering. The PB-PWD9800f flush wall station is a flush mount in-wall frame that allows the Philips TSU9800 touch screen to be flush mounted in-wall, typically at the entrance of a room. This essentially extends the opportunities for which the TSU9800 can be specified and allows the product to compete with other more expensive solutions. One unique feature of the PB-PWD9800f wall docking station is that it allows the unit to be fully charged and truly use the hard wired Ethernet connection to provide a guaranteed communications path. 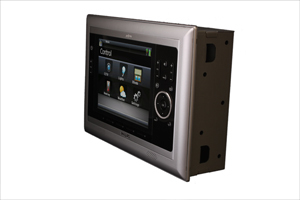 The TSU9800 touch screen is securely held within the flush frame and allows the product to be used as a main in-wall screen or to be used in commercial applications where security and availability are key requirements. The flush wall mount kit comes in two parts, the wall box and the main caddy & frame. The bezel can be removed to gain access to the USB connector and power switch necessary for updating, without the need to remove the complete unit from the wall. The PB-PWD9800f flush wall station will be available via authorised distributors only. These distributors will typically be located in the countries that have authorised distribution for the Philips TSU9800 product range. Outline CAD drawings available on request.